Since 1919, Mossberg has been the leader in introducing important design breakthroughs to the firearm industry. Many product features pioneered by Mossberg are now the standards by which all modern firearms are judged. Their design and innovation is changing the way shooters use shotguns and rifles while bringing reliable, well-built shooting systems to the public at affordable prices. 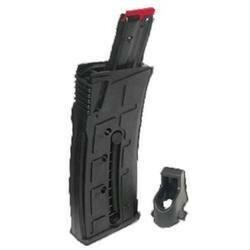 This is a factory replacement magazine for the Mossberg International 715T .22 Long Rifle. This 10-round magazine includes a convenient accessory loader cap that helps load magazines faster and with less effort.